m Shōyu - Japanese soy sauce. The resultant broth is brown-coloured and clear. m Miso - thick & salty paste made from fermented soybeans / rice / barley or any combination of these. m Shio - literally means salt. As it only uses salt for the seasoning, the broth is clear & pale-yellow. m Tonkotsu - directly translates to pork bone. The resulting broth of boiling pork bones, fat and collagen over high heat for long hours, creates cloudy white broth. Wait!! the list doesn't end there, there is the 5th broth, it is called Tori paitan. Tori paitan is similar to tonkotsu in the way it's cooked for long hours, but the main ingredient is chicken. Well good news for us, we can find this 5th broth, served with luscious home made ramen noodles in Indonesia, look no further, it's at Marutama Ra-men. 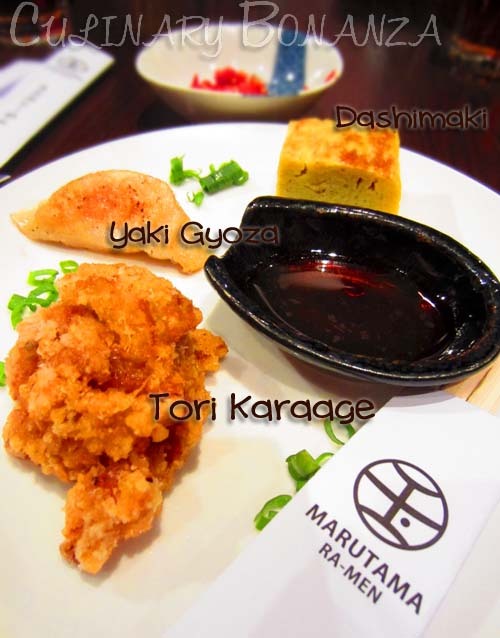 m Yaki Gyoza (grilled pot-stickers with choice of chicken or pork filling). When eaten hot, the crispy skin and the tender chicken filling made chewing such a pleasurable experience! m Dashimaki (seasoned scrambled egg) - it's savoury, unlike the sweet tamagoyaki that you find sitting on top of those nigiri sushis. Tori paitan ramen, topped with tender slices of chicken, smooth nori (seaweed) and spring onions. The home made ramen noodle is just the right thickness for me, it tasted so luscious with the creamy broth. And I'm impressed with how delicious the broth tasted despite not using any MSG in it! What's even better is the chicken slices topping, that felt like it almost melted in my mouth from the tenderness and the slightly sweet and savoury seasoning was a pleasant mish-mash of flavours. 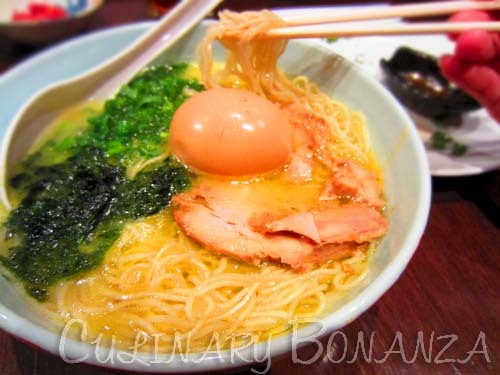 PS: the tamago is not included in the ra-men, so you have order is separately. Nabe literally means hot pot, in a way similar to shabu-shabu, but the stock used for boiling the toppings is the tori paitan broth. The a la carte toppings are for example: tori dango (chicken balls), fish (dory fish), oborotsuki (crab stick wrapped with fish paste), prawn, vegetables, etc. If you're too confused to choose, just pick any of the 3 sets, which is good for sharing among 2-3 pax. 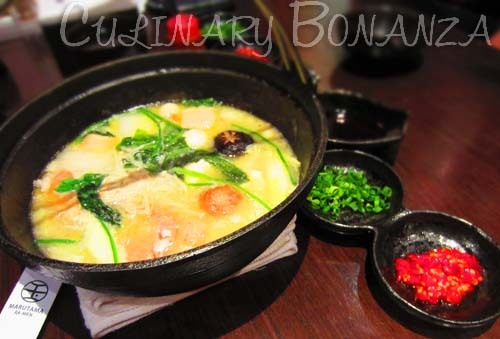 Should you need some carbs to complete your Marutama nabe, you can order the Gohan (plain Japanese rice), Zosui (porridge cooked using the Nabe broth) or kaedama (ramen noodles). I truly loved the Zosui which has spring onions topping. 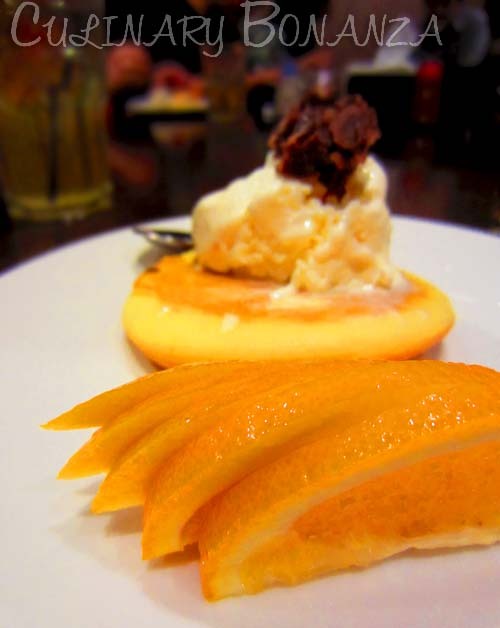 The dessert and beverage selection at Marutama is limited, but you can try the Dorayaki Ice Cream that comes with 3 choice of toppings: pepper, edamame or ogura. I wasn't feeling quite adventurous, so I opted for the classic and fool-proof ogura (red bean paste). The dorayaki was quite tough somehow, I didn't finish mine. m A member of Gading Food Group, which owns other successful franchises in Indonesia such as Fish n Co., Sticky and Cosi. m The tori paitan broth takes at least 5 hours to process and they don't stock on the broths, hence the long and complicated process is repeated daily. m More then half the customers of Marutama are ladies who believe the collagen in the broth helps to improve the skin complexion. I have no doubt about this, collagens ARE scientifically proven to have this function. Alas, I'd like to thank Marutama Ra-men for the invitation to the “Ohayou Bloggers!!! Breakfasting Event” extended to me. I had much joy enjoying the delicious tori paitan broth. Oh, recently, I had actually returned to try the Aka Ra-men and I finished the entire bowl, no broth shall go wasted! the ramen not so special but i really love their nabe!